Welcome to Aulani, A Disney Resort & Spa in Ko Olina, Hawai‘i—ranked #1 Best Hotel or Resort for Families, HAWAI‘I Magazine Readers' Choice Awards 2016. There’s so much included with your stay like the refreshing fun of swimming in the many pools, relaxing your mind and body in a sunset-facing whirlpool spa, gently floating around Waikolohe Valley, taking in the world-class entertainment, the "keiki" playing at a one-of-a-kind supervised kids’ club and so much more. This premier oceanfront resort is a place for families to gather, reconnect and immerse themselves in the stories of Hawaii. 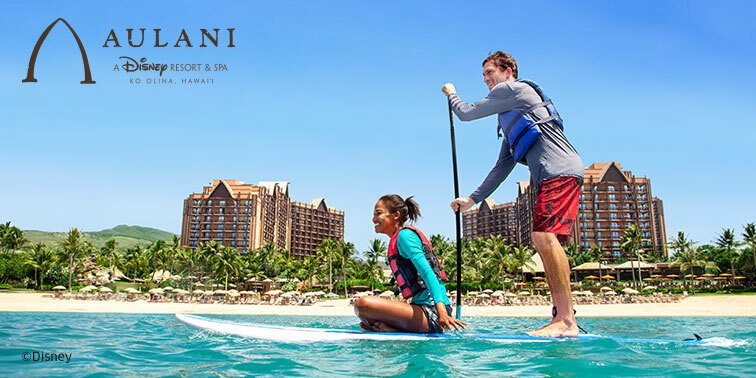 1Save up to 35% valid at Aulani, a Disney Resort and Spa. All savings will be reflected in system prices at time of booking. Valid on new reservations made between 6 pm CST on 10/4/18 and 6 pm CST on 2/13/19 for travel 1/6/19 - 3/22/19. Minimum 5 night stay required. Not combinable with any other discounts or promotions.